Agnico-Eagle’s Meadowbank Mine in Nunavut, northern Canada. Source: Agnico-Eagle Mines Ltd.
Agnico-Eagle Mines Ltd. [AEM-TSX, NYSE] on Monday July 16 released an update on its activities in Nunavut, where the company is developing new gold mines in the Kivalliq region about 300 km west of Hudson Bay. 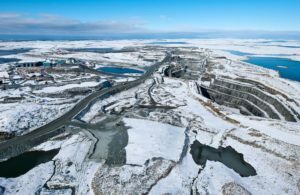 The key assets include Meadowbank, which produced 352,526 ounces of gold and 275,000 ounces of silver in 2017; and Meliadine, which is scheduled for startup in the second quarter of 2019, and will be Nunavut’s fourth mine. At the same time, the company is bringing on a satellite deposit at the Meadowbank Mine. The company is building a 64-km road connecting Meadowbank with the Amaruq deposit. All of those projects are 100%-owned by the company. The Meliadine Mine is located 25 km north of Rankin Inlet, whereas Meadowbank is situated 110 km north of Baker Lake. Output from the Arctic will help Agnico-Eagle to sustainably grow its production to 2 million ounces annually from 1.6 million ounces in 2016, based on its currently approved pipeline, the company has said. On Monday, Agnico said it has received a Type A water license for the Whale Tail pit at the Amaruq Project. On July 11, 2018, the Type A water license was approved by the Minister of Crown Indigenous Relations and Northern Affairs Canada. The permit allows for the construction and development of the Whale Tail Pit. “Preliminary construction work and stripping of the Whale Tail pit will begin in the third quarter of 2018 as expected,” Agnico said in a press release. The Whale Tail deposit remains on schedule and budget for the start of production in the third quarter of 2019. Meanwhile, the Whale Tail underground exploration ramp is proceeding as planned, the company said. At the end of June 2018, approximately 478 metres of ramp development had been completed at a cost of approximately US$10.7 million. Agnico said it is planning to complete approximately 1.2 km of ramp development this year. As well, the company said Amaruq exploration drilling continues to expand known mineralized zones. For example, recent drilling intersected 10.2 g/t gold over 16.9 metres at a depth of 316 metres, confirming the grade and geometry of the Whale Tail ore shoot. “A recent hole in the V Zone returned 10.3 g/t gold over 5.0 metres at 20 metres depth. This is expected to extend mineral resources westward at surface. Agnico shares advanced 0.82% or $0.49 to $60.40 on the news. Industry officials say the presence of a major gold producer like Agnico speaks to the advantages of working in Nunavut. It took only five years for Agnico to get to the gold pouring stage at Meadowbank, said Thomas Ullrich, CEO of Aston Bay Holdings Ltd. [BAY-TSXV], which is focused on the exploration and development of the Storm Copper and Zeal zinc projects on Somerset Island, Nunavut. He was speaking during an interview with Resource World Magazine. “There are very few jurisdictions in the world where you can get a mine up and running that fast,” he said. Agnico also noted that the first boat of the 2018 shipping season has been off-loaded at Rankin Inlet and additional boats are expected in the coming weeks.